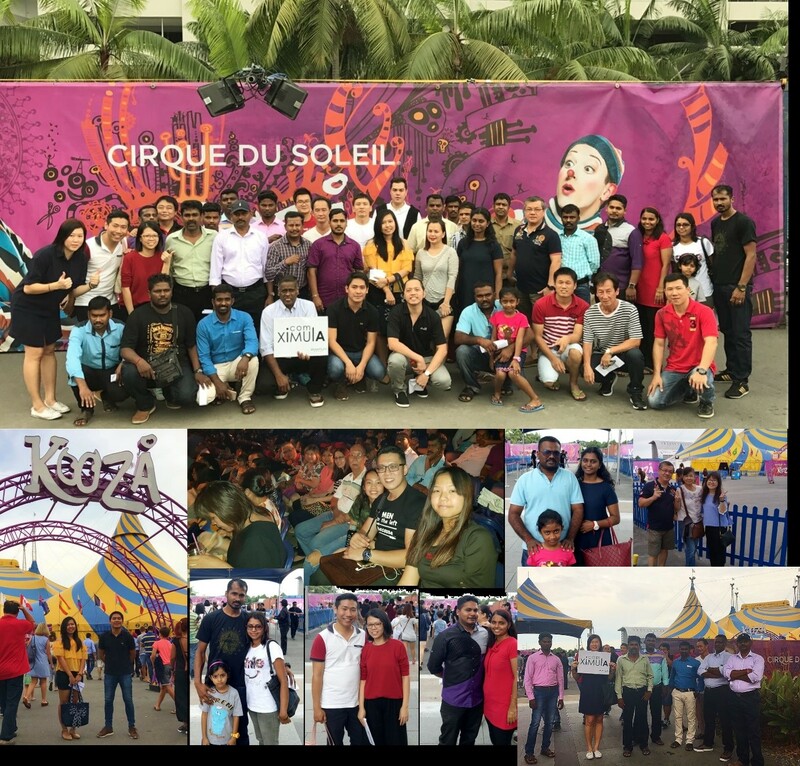 Home/ News Company Event – Kooza! The newest instalment of world-famous circus series, Cirque Du Soleil, returns with the clown-inspired Kooza. Featuring an international cast of 50 acrobats, musicians, actors and singers, the show tells the story of ‘The Innocent’, who goes on a self-discovery trip and meets eccentric characters and experiences countless thrills along the way. And the soul and spirit behind our brand Ximula is elated that our company had organised this outing for all staff and their family. It was a nice Saturday afternoon and all staff and their family were looking forward to the show. And our foreign production workers had dressed well for this outing. We had all arrived early and gather for some photo taking to remember this special outing. Everyone is very excited as for most of us this is our very first circles show. Some of our staff had gone online to “research” on this circus, but this only caused them to be even more excited about the show. After some photo taking, all of us started to enter the circus arena where we can buy some food and drinks for the show. Upon entering the seating area we were taken aback by the design of the circus stages. There were four main pillars with intricate design holding up the gigantic tent. The stars were projected on the tent and it make it look like the night sky. As all of us get seated, the show had started! 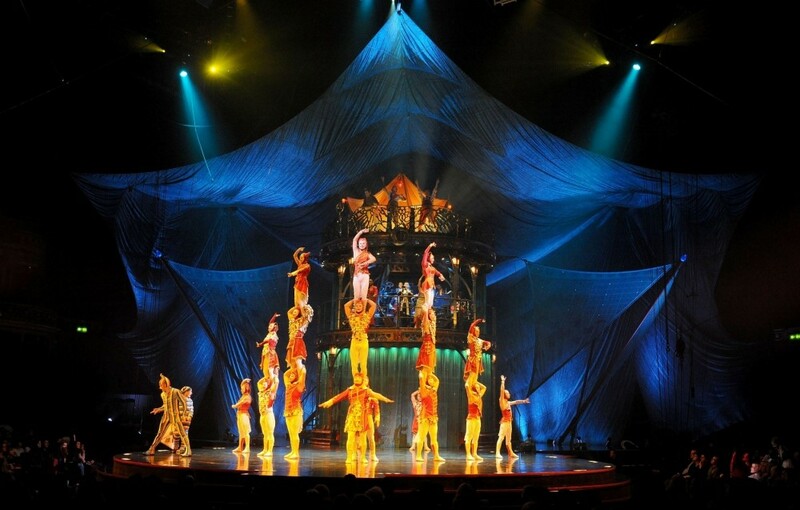 The first act is the Charivari in which we sees the house troupe creating human towers, and using other circus apparatus such as a Chinese pole. And then a trio use balance, strength and flexibility in this jaw dropping feat of contortion. Their moves are so unbelievable and yet so graceful. Everyone was in silence as we all focus on their performance. Next up was a lone performer performs with an aerial hoop. Her performance was breath taking with her very dangerous moves while maintaining an elegant composure. Following up we saw a couple waltz on a unicycle, the woman balances on top of the man while he simultaneously rides the unicycle. Their skill level is so high, they make it seems like they are floating in air dancing around. Then the act get more dangerous with a quartet walk a high wire using props such as bicycles, a chair and even fencing swords. Every moment when they are so high up there we were so worried for them. Right after the high wire act, it get even more dangerous for two guys. 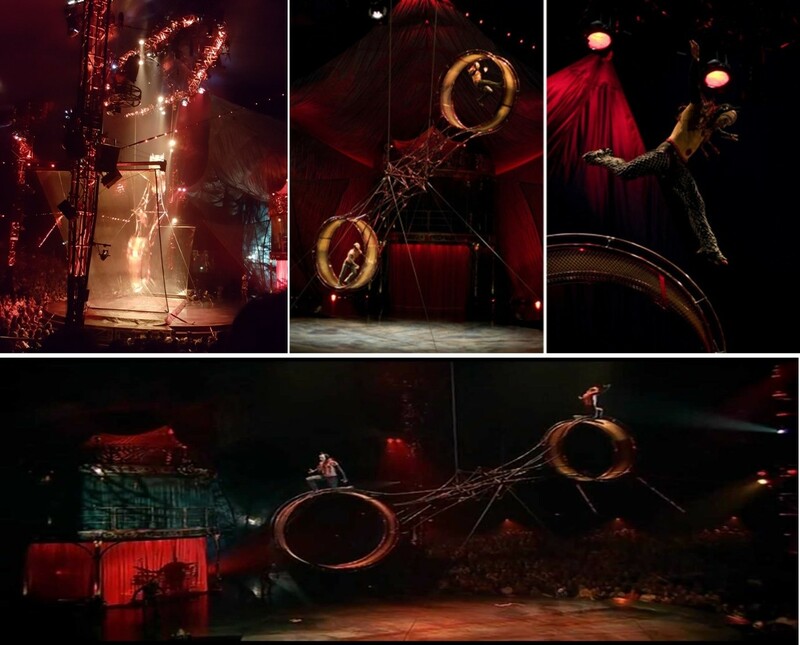 Arguably the most dangerous act in the show, it involves a pendulum with two hamster wheel like walkways at each end. On these walkways two performers jump, leap and skip rope inside and even outside the wheel. After all the high tensions, the act tone down for us to rest our heart and enjoy a great show of dexterity by a beautiful woman. A high caliber hoops act, Irina Akimova weaves spinning hoops around her body. Then a guy came on stage and started a large stack of chairs that tower on the stage who performs a balancing act at the top of the pile. The final act in the show is performed by the house troupe. In this act a performer stands on one end of the teeter board until they are sent flying up by two performers who land on the opposite end. The performer somersaults and lands onto a mat or a tower of people, sometimes the performer even wears stilts. Personally I like this act the most as it is a great display of team spirit. I guess their team spirit is very strong as they had travel around the world performing together. Their moves are so coordinated and everyone knows what they have to do next and at the right timing and positions. There was once when one of their team mate had a failed attempt as she missed the mark and started falling. I was so worried as I watch her fall, but I had worried for nothing as her team mates were already in position to catch her. After she was safely in their arms and on the ground, the first thing the rest did was gathered and checked on her. This is a very touching moment as everyone in the audience applauses and the show went on with a spectacular finishing in which one of the performer somersaults and lands onto a thick mattress wearing a single stilts. Our staff and their family really enjoy the show and not a single one of us left the circus tent without a smile on our faces. Thank you Zhaplin, Thank you XIMULA for the sponsoring of this outing!! !